3. 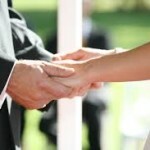 Check with your celebrant that your vows and your partners vows are equal in their awesomeness! No one wants to look like their heart isn’t really in it compared to their partner’s level of commitment! 4. Think what you would say to your partner if it was the last moment you had on earth, what would you say about what they mean to you? 5. Don’t worry about what your guests will think, they will love seeing a beautiful romantic moment shared between the two of you. 6. What are you grateful for in your relationship and what are you looking forward to in your future? 7. Keep it simple, heartfelt and do not waffle on!